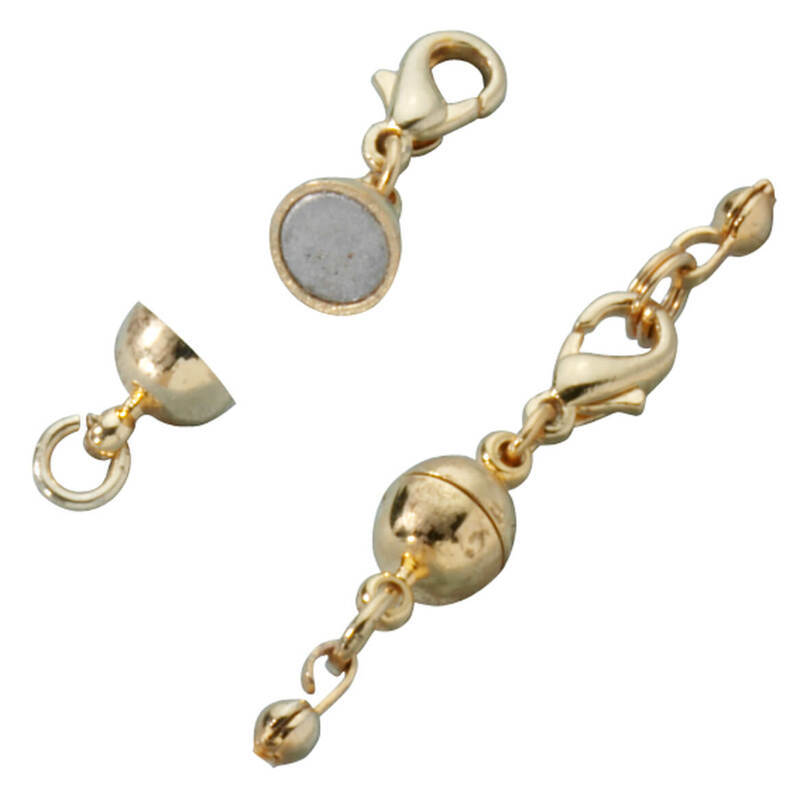 Convert tricky, tiny clasps into easy-locking magnets with a magnetic jewelry clasp! Don’t stop wearing favorite jewelry simply because you can’t manage the clasps. Hook spring rings onto necklace ends, then onto magnetic clasp. Magnetic necklace clasp set comes with 4 spring rings and 2 clasp sets that clip onto jewelry and stay put. Finally, you can wear the beautiful pierced earring styles you love, even though you don’t have pierced ears! A simple-to-use clip on earrings converter transforms any pair of pierced earrings into comfy clip on earrings. Just slip the earring converter onto earring posts and enjoy instant clip-on comfort with no pain or pinching. White metal in goldplate or silvertone. A set of six pairs. 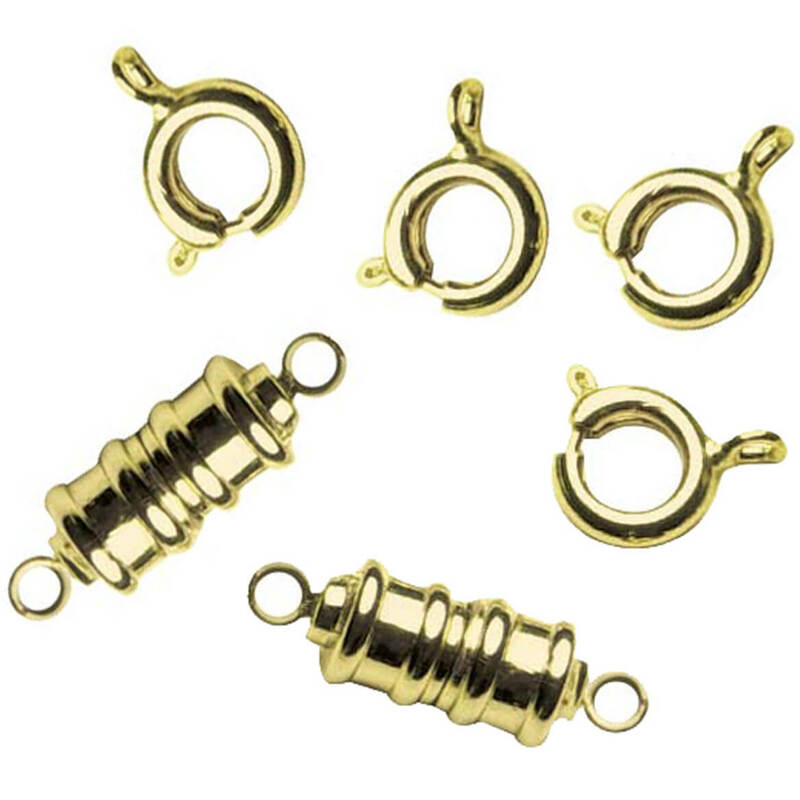 Pierced earring converters are 3/4″ long x 1/4″ wide. This thoughtful jewelry helper fastens both ends of a necklace chain together with powerful magnets – ending your tedious struggle with a tiny clasp! Magnetic clasp attaches easily and works for bracelets too. Brass with gold or silver plating. 1 1/2″ long x 1/2″ wide. With compartments GALORE and its own carrying handle, this bucket-style portable accessories organizer conquers clutter … for tidy containment or easy transport. 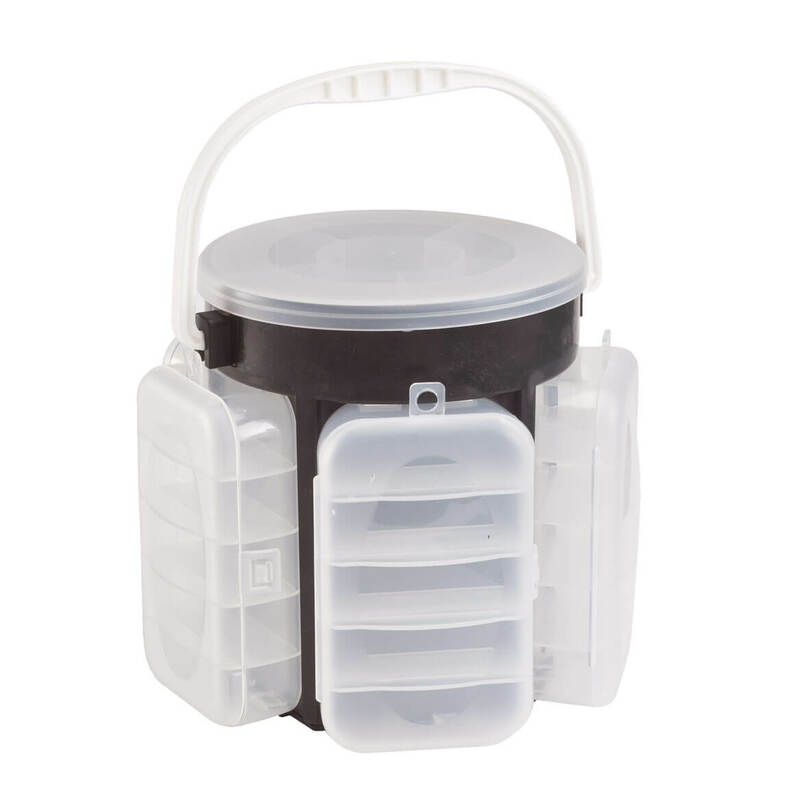 The craft organizer bucket’s hollow center provides interior storage; removable top tray features six open compartments. Another five closed storage containers (with five sections each) snap onto sides of the bucket—easily removing to pop in your totebag or carry-on. Organizing and stowing everything from earrings to art supplies, beads, small hardware, sewing supplies and more, it’s a must for any home! Plastic. Portable organizer measures 6″ high x 6 1/2″ dia. Using powerful interlocking magnets for effortless attachment, these magnetic necklace extenders add extra length to necklaces, bracelets, or anklets. 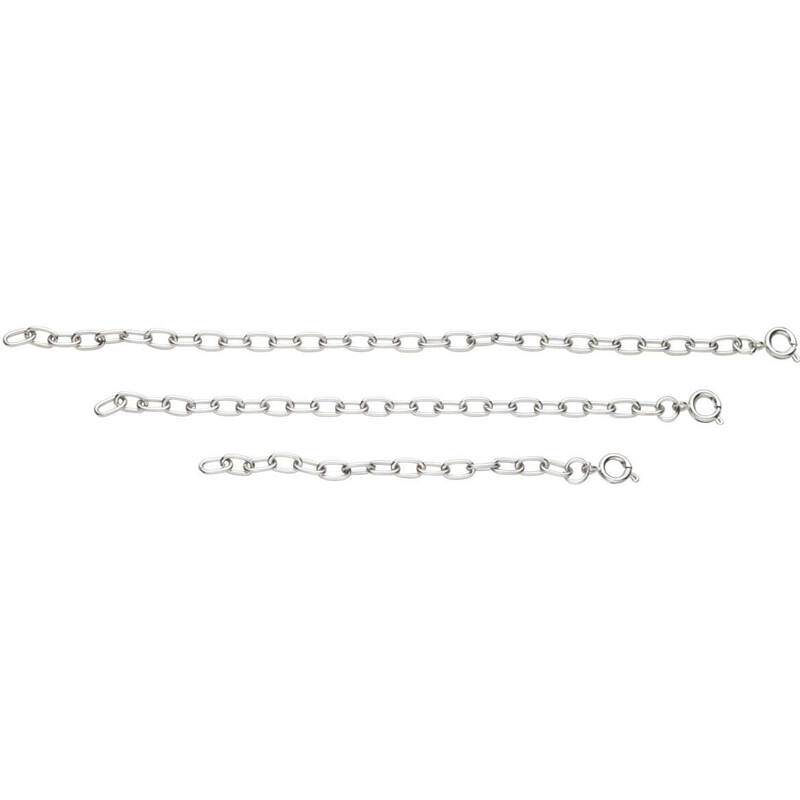 This bracelet extender chain makes it simple to put on and take off jewelry! Our bracelet extender set includes 2″ long and 4″ long extensions that work with most jewelry clasps. Set of 2 necklace chain extenders. 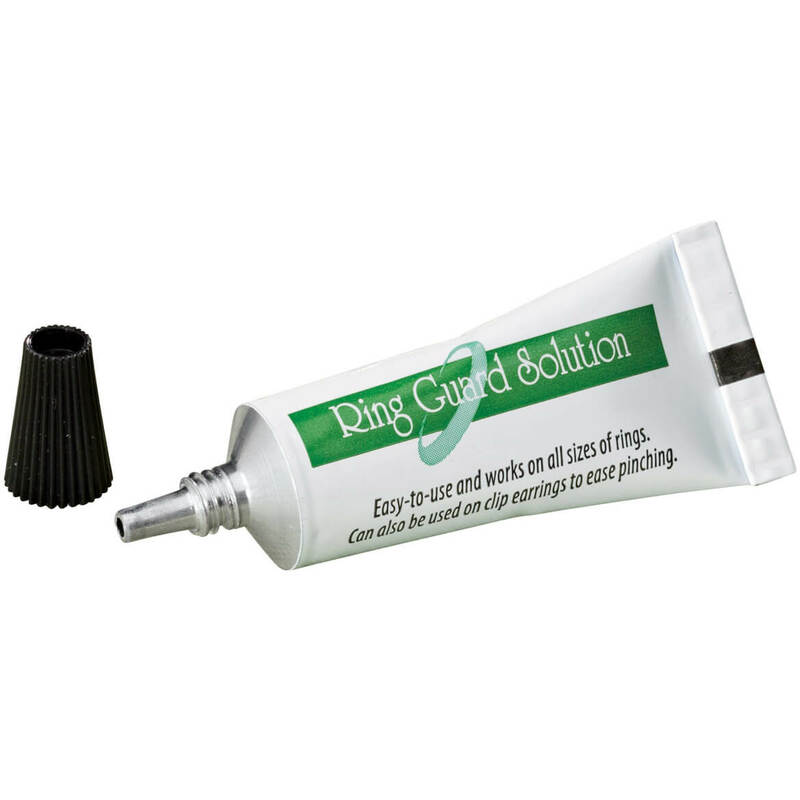 Simply apply ring guard solution to inside of band and it dries to a clear, soft plastic. 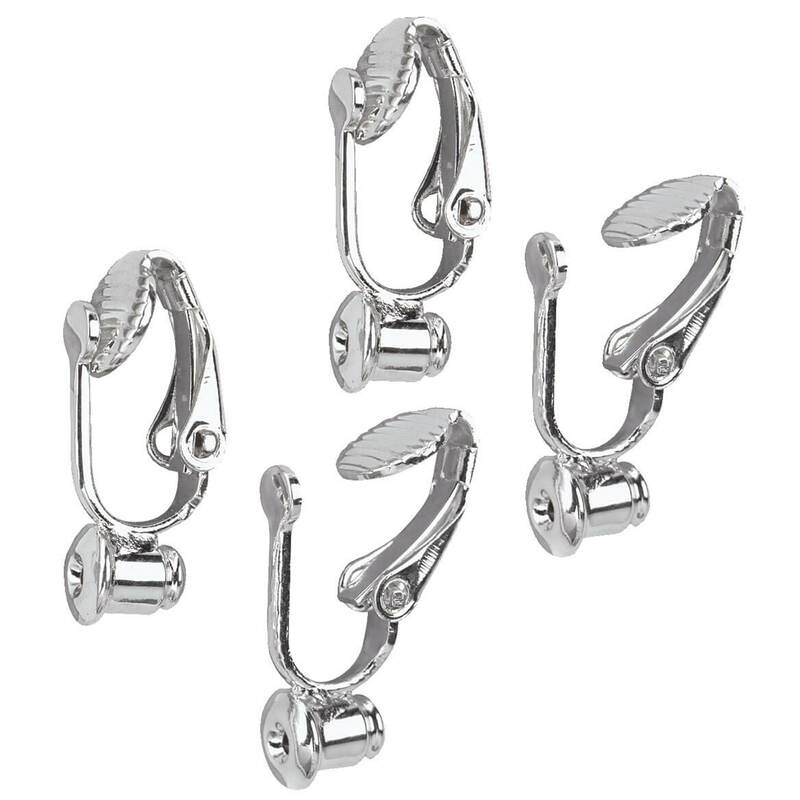 Great for joining 2 bands or making clip-on earrings more comfortable. Can be peeled off for resizing. Includes 2 applicators. 5.5 gram tube. Silicone/rubber. We’ll go to any length to please – and here are three necklace extender lengths sure to please. Our necklace extender set allows you to adjust necklaces to the length you want. 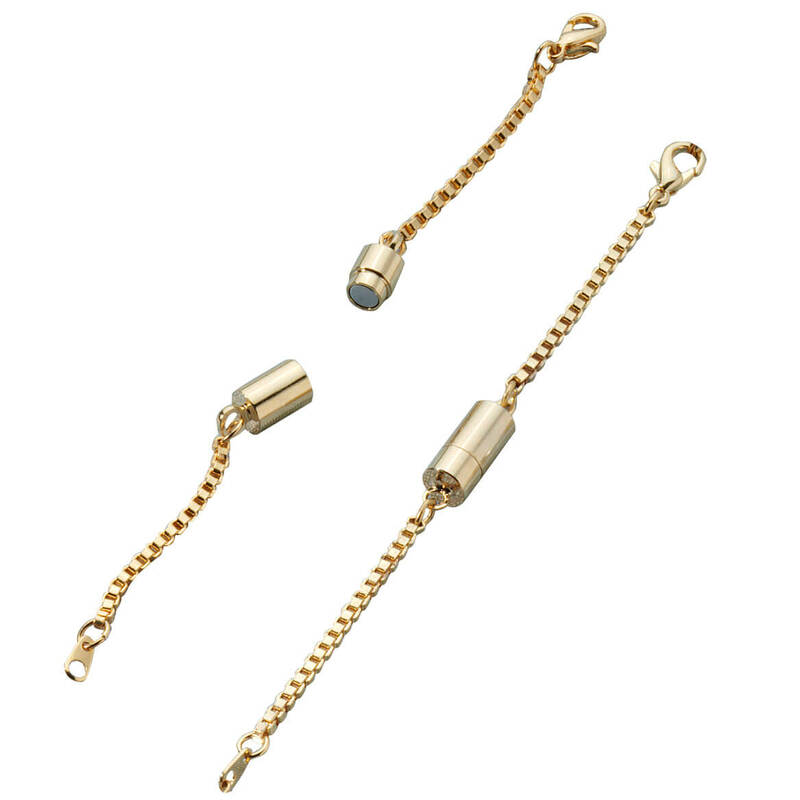 Gold- or silver-tone necklace chain extender sets have one 3″, 4 1/2″ and 6″ length; spring closures. Set of 3. These soft spiral ring sizers wrap easily around the back of any ring band—instantly transforming a loose fitting ring to just right! Designed in flexible plastic that’s safe for sensitive skin, each clear, discreet ring sizer insert slips easily over knuckles, keeping rings comfortably snug and secure. Unique spiral design won’t slip or pop off while wearing, yet they unwrap easily if you want to remove and reuse. 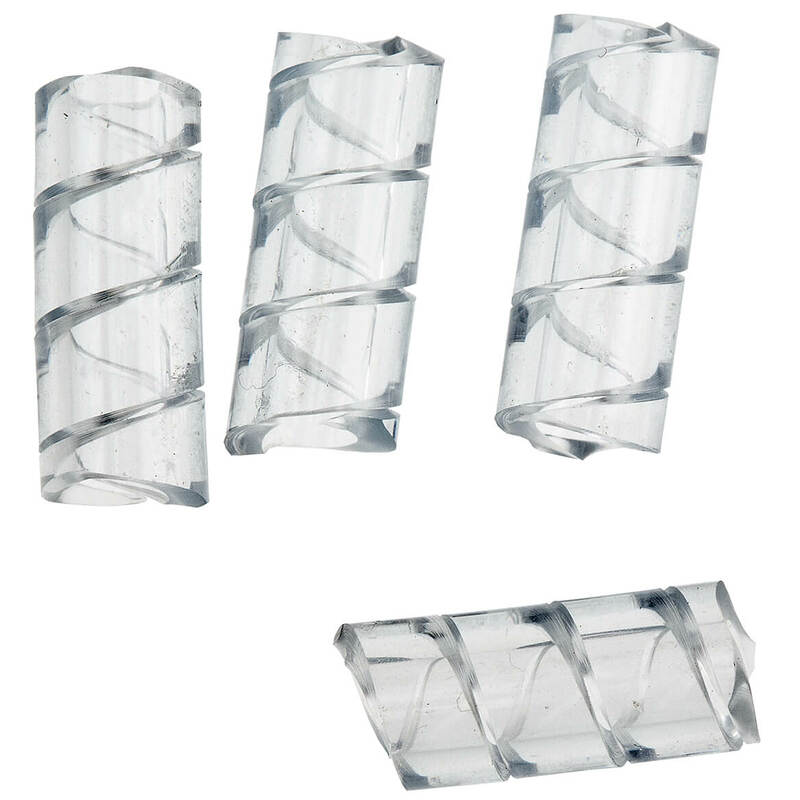 Set of 4 plastic ring sizers. Each, 9/16″ long. Help all your necklaces fit perfectly with this pack of extenders in 3 styles and lengths. The 1″L extender features 2 large, easy-to-open rings that flip open and snap shut — perfect for anyone with limited dexterity. The 1 1/4″ long extender features a clasp on one end, a ring on the other, and 2 magnetic faces that effortlessly snap together. The 2 1/2″ long extender features magnetic ends that snap together. Choose from silvertone or goldtone to complement any wardrobe. Organize your jewelry collection while maximizing space. Over the door jewelry organizer displays your jewelry around an oval mirror for easy accessorizing. Scroll metalwork design features 15 hooks for tangle-free hanging of necklaces and bracelets, holders for up to 28 pairs of earrings, and a shelf perfect for storing makeup or fragrance. 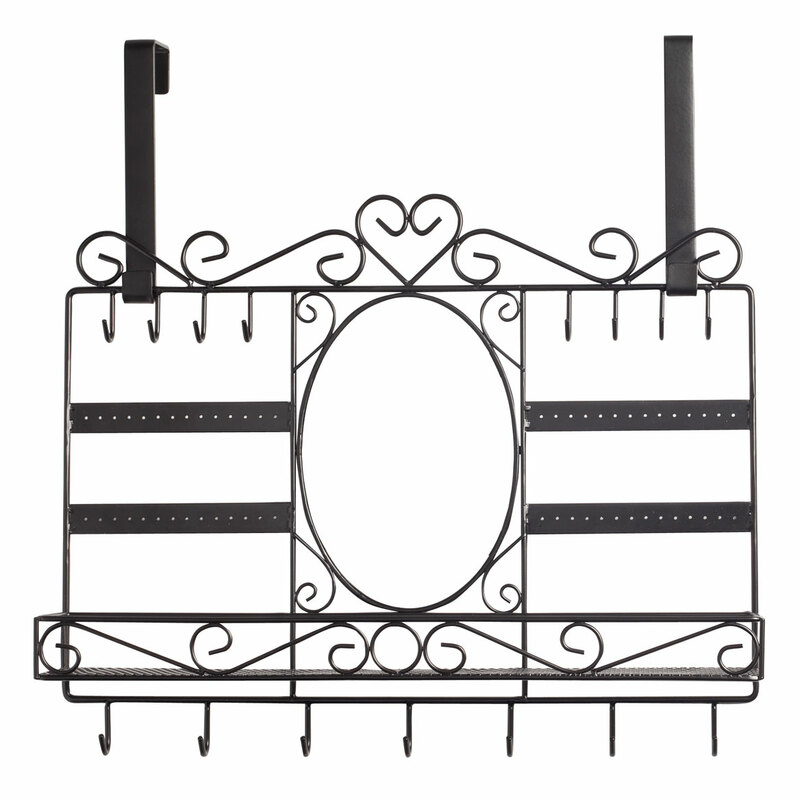 Jewelry stand hangs on a door up to 1 1/4” thick using the included hooks. 17 3/4” long x 3” deep x 14” high. Compare at $32.50!